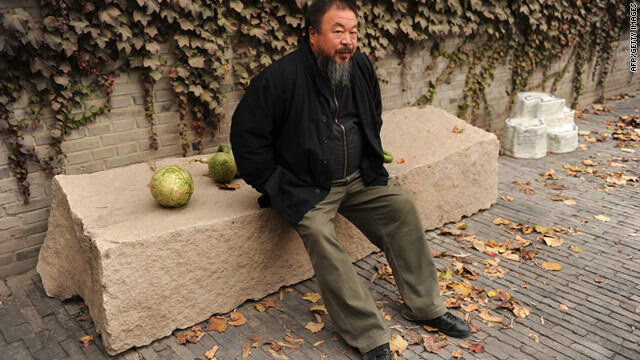 Ai Weiwei, shown in this file picture, has not been seen since Sunday when he was en route to Hong Kong. They warn that he will "pay a price for his special choice"
(CNN) -- China's ruling Communist party unleashed a blistering attack Wednesday on dissident artist Ai Weiwei -- and on the West for criticizing his apparent arrest. Ai has not been seen since Sunday, when he and an assistant said on Twitter that they had been taken into custody en route to Hong Kong. China broke its silence Wednesday with a pair of articles in a Communist party newspaper. One Global Times piece said he had been "detained by police, according to overseas media reports." The other article, an editorial, said Ai "has been close to the red line of Chinese law... as long as Ai Weiwei continuously marches forward, he will inevitably touch the red line one day." "He will pay a price for his special choice, which is the same in any society," said the editorial, which called him "an activist," and "a maverick." Ai, one of the country's best-known artists, helped design the iconic Bird's Nest stadium for the Beijing Olympics, but later called for a boycott of the 2008 games because he said China was using them as propaganda. The artist has also accused the Chinese government of trying to silence dissidents. The Global Times editorial Wednesday blasted "Western governments and human rights institutions" for calling for his release. It accused them of "reckless collision against China's basic political framework and ignorance of China's judicial sovereignty to exaggerate a specific case," and failing to find out "the truth." "The West's behavior aims at disrupting the attention of Chinese society and attempts to modify the value system of the Chinese people," the Global Times said. The Chinese-language version of the article is harsher, saying criticism from the West is the reason Chinese people "loathe" it. Ai Weiwei's name has apparently been censored on Chinese online forums, but people are getting around the ban by using nicknames and puns, or by using his father's and wife's names in posts. Some also refer to him as a baker of sunflower seeds, a reference to his installation at London's Tate Modern art museum of 100 million painted pottery sunflower seeds. Police surrounded his studio Sunday after authorities reportedly detained him at a Beijing airport. "They crack down on everybody who has different opinions -- not even different opinions, just different attitudes," he told CNN last year. "Simply to have different opinions can cost (dissidents) their life; they can be put in jail, can be silenced and can disappear." In the past, Ai has noted that he has paid a price for his own dissent. In January, the artist said authorities placed him under house arrest to stop him from attending an event he planned after officials announced that his new studio would be demolished. "Just recently I heard the new studio I built in Shanghai will be demolished, all because of my activities," Ai said at the time. "So what is my activity? My activity is very simple, asking basic rights for people to freely express themselves and also to find a new structure, a new way of communicating. Because I'm an artist and this is what I do and I believe in that." In the past several weeks, Chinese authorities have detained and arrested a number of lawyers and human rights activists amid calls for anti-government protests similar to those that have swept the Middle East. CNN's Eve Bower, Eileen Hsieh and Kristie Lu Stout contributed to this report.